This entry was posted on Wednesday, March 24th, 2010 at 1:03 pm and is filed under Mozilla, Security, NoScript. You can follow any responses to this entry through the RSS 2.0 feed. Both comments and pings are currently closed. Wouldnt it be possible to whitelist 95% of the most common fonts that are included like this via md5? At least that way most sites can be functional with only offbeat fonts needing to be added. Freetype has actually been exposed to untrusted content for a long time now. For example, Word documents and PDF documents both allow embedding of arbitrary Truetype fonts. NoScript is the Tin Foil Hat of the internet. You obsess about security and you're all running Windows. The joke is over, stop it would you! Ryan Allen: I run Firefox on my x86-64 Linux system, not Windows, so I'd say the security it provides me is no joke. Whitelisting fonts based on a secure hash (not MD5) would be one good idea, so long as that whitelist is not saved anywhere - otherwise the server could easily return a good font once, and any arbitrary data the next time. Er, my statement didn't quite make sense... the whitelist itself obviously has to be saved, but automatically adding the URLs/domains/etc of any font that matches a whitelisted hash to the allow list would of course be a bad idea - the file needs to be tested every time it's downloaded. Chromium passes all web font through a sanitiser first which, as one of it's actions, removes the hinting tables. @Ryan Allen. Get a clue. Has it ever occurred to you that Windows 7 != Windows 95? OSX is a security nightmare (Apple often react slowly to exploits) and the same linux newbs who say this rubbish are the ones telling users to go grab randomly repackaged deb/rpm files off google (from untrustworthy developers), when the original developers don't support their packaging system. Hilariously, they also don't realise that Microsoft would NEVER make many of the serious and obvious security issues distro's like Ubuntu had (like sudo authentications which could be reused by viruses to easily escalate privs, or exposing passwords in full text). Of course, people like you are simply sheep. The author of the program should make a script to make this page into a readable colour theme. Recaptcha works with a word from a scanned book and a "real" word. Supposedly the user doesn't know which. In reality the "real" word is easily identifiable. CAPTCHAs are a nuisance, an usability and accessibility nightmare and an embarrassing fail. ReCAPTCHAs are no different. Even the name is a sign of stupidity. Personally, I also use noscript. Nevertheless, I must say that firefox is way much better that Internet explorer. 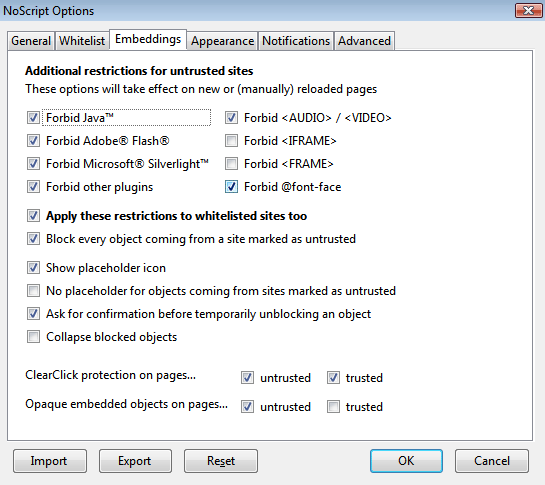 Is the browser.display.use_document_fonts preference set to 0 essentially the same as the "Forbid @font-face" option? Nope, because using the built-in preference you can't choose to selectively allow web fonts on pages you trust or temporarily allow specific font instances. Have you ever tried to explain to intelligent, but never-before computer users, sometimes 80-years-old and above, how the dangers of the web and all its traps - THEN try to explain Giorgio's excellent program and WHAT TO DO to stay protected AND get to view the site? ... that would allow me to put stronger security on their network AND get some rest? "Here comes a candle to light you to bed"